Librarians in New York's oldest library have uncovered a surprising borrower with overdue books: George Washington. The New York Society Library says it will not pursue the fine. It would simply like the books back. 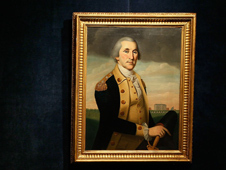 He famously never told a lie, but it seems George Washington was not without his faults, the BBC's Madeleine Morris notes, reporting from Washington. On 5 October 1789, the first president borrowed two books from what was then the only library in Manhattan - "Law of Nations," a dissertation on international relations, and a volume of debate transcripts from Britain's House of Commons. George Washington did not even bother to sign his name in the borrower's ledger. An aide simply scrawled "president" next to the title to show who had taken them out. The two tomes were due back a month later but were never returned and have been accruing late fees ever since. Librarians uncovered the misdemeanour as they were digitising the library's ledger from that time. The New York Society Library says it will not pursue the fine but it would like the books back. Sadly for fans of 18th-Century political literature, they appear to have vanished. On the balance sheet of George Washington's achievements for America, mark down two small losses, our correspondent says.